So the news of the NFL week starts in Charlotte, where owners begin gathering tonight for the annual quickie spring meeting (24 hours for these impatient billionaires), and by sundown Tuesday we’ll have three new Super Bowl cities. Let’s start there, handicapping Super Bowls 53, 54 and 55, with a special emphasis on the middle one, because it will end pro football’s 100th season, and you know how the NFL likes to put on a show when there’s some sort of anniversary. • Super Bowl 53, February 2019: Atlanta over New Orleans. The Saints would love to give 88-year-old Tom Benson one extremely important gift this late in life, another Super Bowl to finish the 99th season of professional football. And it could happen. But I think there’s more impetus to give the game to Atlanta. The new Falcons stadium, which opens in the summer of 2017, will have had two regular seasons to work out the kinks. Atlanta has the college football national championship game in 2018, and the Final Four in 2020. Every franchise in the south (and some in the north) that builds new stadiums gets a Super Bowl early in the life of the new building, and Atlanta has not hosted the game since 2000. Super Bowl 54, February 2020: South Florida over Los Angeles and Tampa Bay. The truth is the NFL would love to give the Super Bowl capping the league’s first century to the city where the first Super Bowl was played, Los Angeles. It could happen. But the Rams would really prefer to not be preparing for a Super Bowl in the first season the new stadium in Inglewood is operational. The NFL usually gives teams with new stadiums at least one season to work out the kinks before handing it the golden game. The organization doesn’t know if the huge stadium and campus will be fully up and running by the end of that season, and the last thing the league and team would want is for such a historic Super Bowl to have UNDER CONSTRUCTION signs on the site of the game. So the pick here is a reward for Stephen Ross and south Florida, for all the refurbishing the Dolphins have done on the stadium there. This would put south Florida in the all-time Super Bowl lead—if it gets an 11th world championship game 51 years after hosting the biggest upset in Super Bowl history, the Joe Namath-led Jets win over the Colts. Super Bowl 55: February 2021: Los Angeles over Tampa Bay. With the Rams pushing for a Super Bowl after their second regular season in L.A., that makes this season more likely. Although Tampa Bay will be doing work on its stadium that makes the NFL happy, it’s probably not enough to win the day in either of the last two games to be awarded. 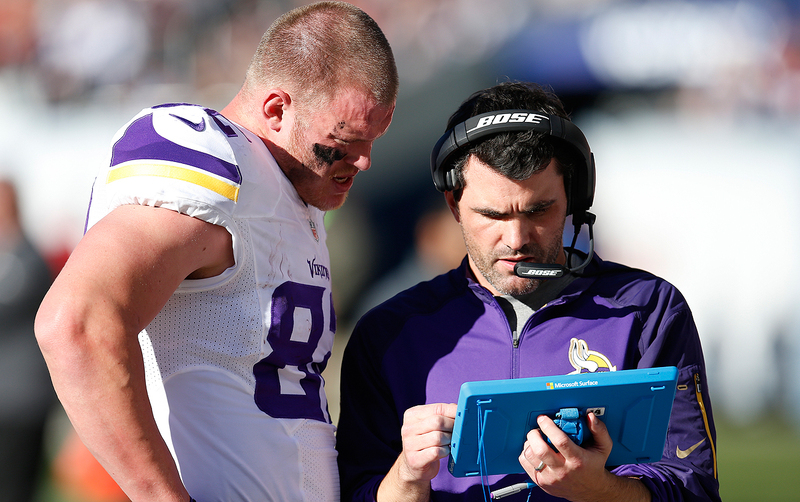 The NFL is considering allowing video to be used on sideline tablets during games. Currently, only still images can be utilized. • Video study on sidelines during games. Currently, teams can look at still images on their Microsoft Surfaces on sidelines during games, or on images faxed from the press box the old-fashioned way. Last year, during a few preseason games and the Pro Bowls, coaches and quarterbacks could watch video on the Surfaces, and the players and coaches loved it. “The teams that used it want this to to pass—badly,” one longtime GM said Saturday. “The Microsoft technology was just too good.” But because all teams didn’t have the chance to use the video, some teams could vote against it and say they want to study it one more preseason. It is likely, though, that whether it’s 2016 or some season in the near future, teams will graduate from pictures to video on the sideline. It makes too much sense to use the technology. • Washington’s proposal for one roster cutdown. The NFL cuts rosters from 90 to 75 after the third preseason game, and then from 75 to 53 after the fourth preseason game. Washington is proposing one cutdown, from 90 to 53, after the fourth game. Seems harmless. Don’t sense any momentum for it, though. Doubt it passes. • A convoluted proposal to define what’s NOT replay-reviewable more clearly, twinned with giving the New York replay center more power in officials’ calls. The second part of this is more important. If this passes, NFL vice president of officiating Dean Blandino and his lieutenant, Alberto Riveron, would be empowered—as they were in the 2015 playoffs—to correct administrative errors with direct communications to the referees at game sites. This would cover corrections in marking of the football, enforcement and correct yardage of penalties, and game- and play-clock operations. “It’s a fail-safe for the officials,” said one source. “It became clear during the playoffs last year that it was good to have this as an insurance policy for the on-field officials. There’s no reason not to have it.” But Blandino and Riveron would still not be able to dictate reversals or upheld calls under review. The first part of the rule simply makes it clearer what can and can’t be reviewed, so it’s not a matter of such confusion to coaches. Three other notes: A source said the Ravens withdrew a proposal that would make replay-reviewable potential defenseless-player hits by defenders on offensive players. No word given for it, but likely this happened the way many withdrawals do—because Baltimore thought it had scant chance of passage … One hour has been set aside at the meetings so the league can discuss the next wave of research and funding for player health and safety … There is nothing on the league agenda about the Raiders’ dalliance with Las Vegas. But this is the elephant in the meetings, and it’s likely that there will be at least lobby and backroom talk about it, even if the normally reticent Raider owner Mark Davis doesn’t stand up and bring it to the floor during the general session. There is a general feeling in the league that 10 years ago a franchise in Vegas would have been laughed at. But you know this league. If owners think it’s a cash cow, all of sudden the trepidation over playing a couple of miles from where legal bets can be made on NFL games is suddenly going to go away. What a surprise. 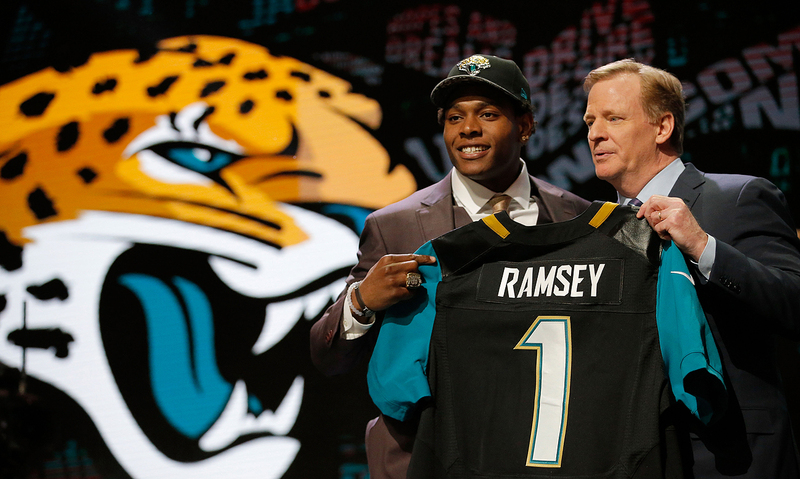 The Jags will learn soon the severity of a knee injury suffered by first-round pick Jalen Ramsey. What I heard about the Jaguars coaches and staff on rookie cornerback Jalen Ramsey’s knee injury is, “They’re holding their breath.” A year after top pick Dante Fowler was lost for the season in May drills with a torn ACL, top pick Ramsey walked into the Jags’ complex last week and said his right knee was sore. A tear of the meniscus was diagnosed. And today or Tuesday, Ramsey is scheduled to get a second opinion at the nearby clinic of respected orthopedist Dr. James Andrews. Normally, a meniscus tear is not nearly as serious as other knee tears, but the severity of this one is in question. GM David Caldwell told me Saturday, “Jalen will play a lot of football for us this year. It’s not anywhere near as severe as Dante’s.” Caldwell said he was optimistic the second opinion would back up the Jag team medics, who seem confident this is not a major injury. In addition, there were reports last week that Ramsey had microfracture surgery on the knee in high school. But the Jaguars are expected to counter that report this week, and deny that Ramsey has had microfracture. Now this is downright strange. The NFL is investigating the by-the-book Ravens for violating one of the simplest and clearest rules in the collective bargaining agreement: practicing in pads during their rookie minicamp. Teams cannot work in full pads until training camp, but Jamison Hensley of ESPN.com reported last week that there was a period during one of the rookie practice sessions that all players in a drill were fully padded, and tight end and NFLPA rep Benjamin Watson—according to Hensley—said the rules were the same for rookies as they were for the full squad: no full pads until training camp in July. It is not likely the NFL will buy Baltimore’s claim (if the Ravens do claim this) that they didn’t know rookies couldn’t be in full pads. This is the sixth season of the current CBA, and coach John Harbaugh has been the coach for all six of those years. “Just let them keep it. It ain’t hurting nobody,” said Rusty Whitworth, a 58-year-old member of the Salish and Kootenai tribes. I’ll write more about this tomorrow, in a column devoted to this topic, but suffice it to say that this is a personal opinion (mine) to not use the team name, and I haven’t changed. You’ll very likely see the Tom Brady case take the next step today, the deadline for the next hearing following the 2-1 ruling by a three-judge panel of the U.S. Second Circuit Court of Appeals’ last month that overturned last fall’s ruling that freed Brady from his four-game suspension. The Second Circuit has to determine if it will take the case, first of all, and it’s not likely the court will; SI.com legal analyst Michael McCann says this court takes on cases such as this less than 1 percent of the time. If that court won’t hear the case, it’s likely that the Brady/NFL Players Association legal team will appeal to the United States Supreme Court. That seems an even longer shot. There aren’t many in the legal community who give Brady a good chance to either overturn the suspension or continue to push the legal ball down the field so he’d be able to play while the case continues to be adjudicated. But as we discovered just before the start of the season last year, with Judge Richard Berman’s ruling allowing Brady to play, sometimes you get upsets when courts are involved. So stay tuned. 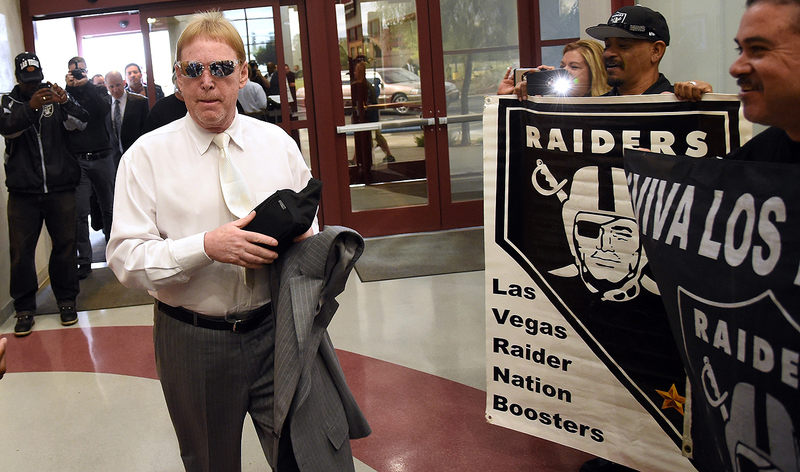 Owner Mark Davis is exploring the option of moving the Raiders to Las Vegas. — New England Patriots owner Robert Kraft, joining Dallas’ Jerry Jones as high-profile owners supporting the Raiders’ move to Las Vegas, in remarks to USA Today. — Hall of Fame quarterback Warren Moon, on quarterback Robert Griffin III, trying to rebuild his career in Cleveland after getting released by Washington, in an enlightening story by former Washington Post beat man Jason Reid—now a senior NFL writer for The Undefeated. Really good story. I admire an enlightening story when the subject of it won’t cooperate. And Reid writes that Griffin wouldn’t. —J ason Reid, in the RGIII story, on Griffin ignoring the influence of the first black quarterback to win a Super Bowl, Doug Williams, who works in player personnel with Washington now. — Warren B. Lessing, a 93-year-old World War II veteran, in a letter to the U.S. Court of Appeals, Second Circuit, pertaining to the Roger Goodell/Tom Brady Deflategate case, via sports law attorney Daniel Wallach. 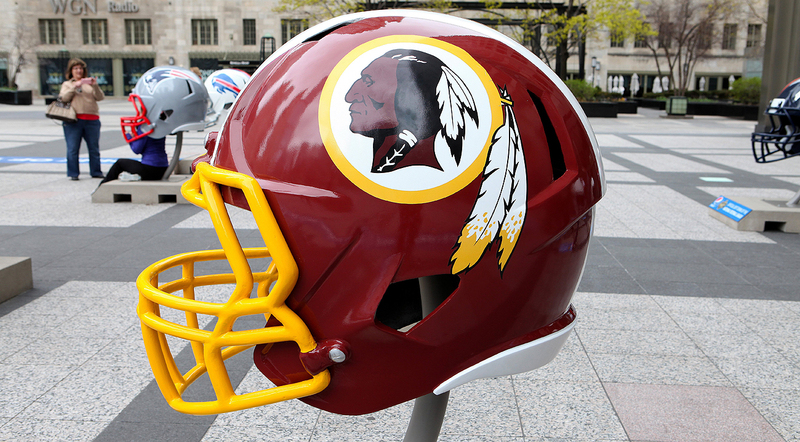 A three-judge panel ruled in favor of the NFL last month in the case. 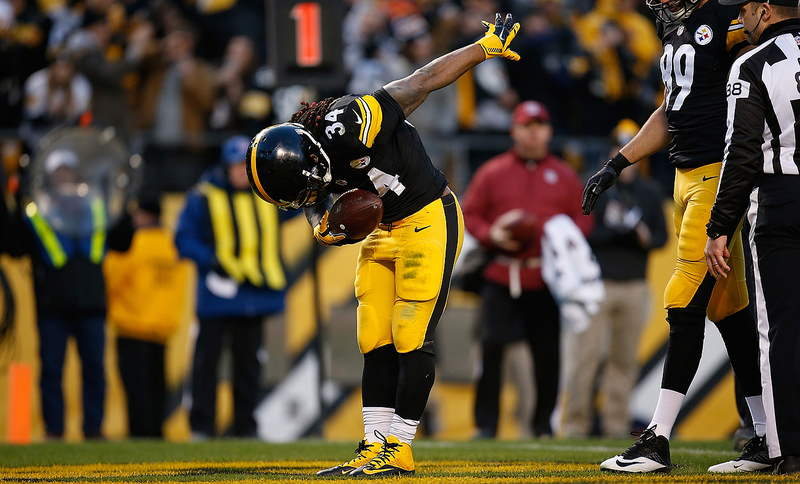 DeAngelo Williams has the third-most rushing touchdowns of any active running back. The decline in emphasis on the running game is making the touchdown run passé. Find an offensive category in NFL history with only two of the top 50 players of all-time being active today. That’s the case with rushing touchdowns. Peterson is 10th, Gore 30th, Williams 52nd. Hot dogs: Atlanta $2, Oakland $6.75. Domestic beer (12 ounces): Atlanta $5, Philadelphia $8.50. Soft drink: Atlanta $2 (12 ounces); San Francisco (16 ounces) $6. For those who have to pay the one-time personal seat licenses (priced between $500 and $45,000), it’s an olive branch too. The stadium is set to be completed on June 1, 2017. At Bud Grant’s garage sale in Minneapolis over the weekend, he sold three lawn frogs for $75 apiece. Not sure what’s more interesting: that there are such things as yard frogs (stone frogs you can place as lawn ornaments in your yard), or that they sold. Scroll down for some interesting images of the event. • I was on an American Airlines flight from Kansas City to O’Hare the other day. A man walked down the aisle and into the row of his seat, and he bumped his head hard on the area right below the overhead bin, causing the underside of the bin to fly open. The guy was okay, looked at the yawning under-bin with wires hanging out, and figured he should probably just leave it alone. The flight attendant came by and said she’d alert maintenance. I’m thinking, Why don’t they just try to close the hatch themselves, before calling maintenance? But, you know, everything in the world can’t be left up to me. So we waited, and all the passengers boarded, and it was maybe 15 minutes before a maintenance fellow showed up. He took one look at it, carefully moved the under-bin piece back into place, made sure none of the wires would be pinched, and then closed it with a click. Took him seven seconds, max. But then, of course, “the proper paperwork” had to be filled out and signed off. Yes, the paperwork. The captain came on and said we’d be underway as soon as “the paperwork” was complete. Five minutes. Ten minutes. Fourteen minutes. “We’re just getting the paperwork completed, and we’ll be underway.” All in all, it was a 31-minute delay, to snap a bin shut and dutifully record it in some logbook. In the immortal words of Laura King, I mean, I’m just saying. Exaggerator won the Preakness, or at least he says he did. @montgomeriefdn Colin, great to have you at Trump Turnberry. So proud of you and your GREAT playing! You made winning MAJORS look easy! One problem: veteran golfer Colin Montgomerie never won any of the tournaments acknowledged to be the four majors (Masters, British Open, U.S. Open or PGA). He did, however, finish eighth in the Masters once. This was the non-sequitor Tweet of the Week, but I loved it nonetheless. Joey Bosa, the No. 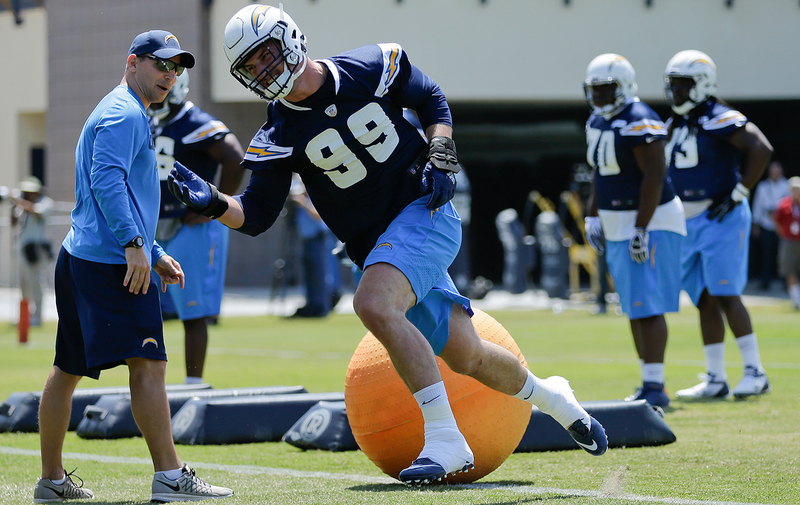 3 overall pick, hit the field with the Chargers earlier this month. 1. I think you’ll read more about the NFL Players Association’s Rookie Premiere event from the weekend in Los Angeles this week from Emily Kaplan, but I wanted to point out one interesting thing from the deal: Of the 41 invitees, 40 are offensive skill position players. The lone outlier was Chargers top-pick defensive end Joey Bosa. Reports Kaplan: “If February’s combine in Indianapolis is a job fair for prospective players, consider the Rookie Premiere in Los Angeles a business combine—the newly minted professionals are exposed to marketing and sponsorship opportunities, and can flaunt their individual brands to attract long-term partnerships. Why the love for only quarterbacks, running backs and wide receivers? Surely the seven first-round offensive linemen could benefit from this, as could a player like Jaguars linebacker Myles Jack, who is considered supremely marketable. The roster is crafted by the NFLPA’s business partners, such as Panini, a trading card company, and EA Sports, which calculate what sells. [These partners pay for the rookie’s trips to the exhibition, and each participant leaves with a minimum of $12,000 for signing cards, recording video content, etc.] There were initially 40 invitees. However one player was a late add: the Vikings’ Moritz Boehringer. He was a hit at the three-day event, though much of the NFL world and its surrounding hoopla is still foreign for the German-born wideout. In one sponsor obligation, players were asked to do dramatic readings of Justin Bieber lyrics. “I just don’t know what to say,” Boehringer said to the videographer. “Just repeat, ‘Baby, baby, baby,’” the videographer instructed. Boehringer obliged, reciting the lyrics with his thick accent and intermittent giggles. As he exited for his next obligation, he remarked: “This might be the weirdest thing I’ve ever done.” Later this week, Kaplan will have a further report on the event, with some good intel on Paxton Lynch. a. The Super Bowl-champ Broncos have a number of 9, which seems low, and is certainly an indictment of their quarterback situation. Your move, Mark Sanchez. b. The Tom Brady-suspension factor lives: The Patriots have won 12, 13 or 14 games for each of the last six seasons. Bovada has New England with 10.5 wins. 3. I think one interesting thing looking back on the draft is the Atlanta pick of Florida safety/linebacker Keanu Neal. Widely viewed as a reach at 17 by Atlanta (he was projected to be a second-rounder by most of the draft gurus), what the Falcons have seen this month are things well beyond his years. Neal is 20; he won’t turn 21 until the week the Falcons open training camp in July. Coach Dan Quinn will rely on him early on to be a defensive leader (which he was last year, clearly, at Florida), both verbally and on the practice field. He won’t be a physical force in the way of Kam Chancellor, whom he’s been compared to—he’ll be more of a sideline-to-sideline presence down in the box and deep in center field. The Falcons also think he’ll be able to man-cover the good tight ends in the division: Carolina’s Greg Olsen, Coby Fleener (the free-agent who landed with the Saints) and Tampa’s Austin Seferian-Jenkins. We’ll see about whether Neal is worthy to have been picked that high. The Falcons need a smart, fluid, versatile, communicative safety, and there will be pressure on Neal to be that guy right away. 6. I think one of the biggest offseason problems with the NFL is that we cover it too much. Waaaaaaay too much. With really stupid stuff, sometimes. The Newark Star Ledger had a headline Friday on the web saying, “Giants’ Odell Beckham Jr. named 1 of most hated players in NFL history.” It detailed a Sporting News story on the 40 most hated players in NFL history. How Odell Beckham could have become one of the most hated players in NFL history in two seasons (and, really, for one idiotic performance against Josh Norman) is pure madness. So I went and looked at the list, which is hilarious for its recency alone. No one on the list of most hated players in the history of pro football played in the first 50 years of pro football, from 1920 to 1970. (Jack Tatum was the most veteran of the group, and he debuted for the Raiders in 1971.) But hey, why bother to do the work to find out the villains of the Lambeau Era? Nineteen-year-olds haven’t heard of them, so why bother with them? The point is, people are going to click on a list like this, even if it’s insipid and stupid. After all, I clicked on it, which is certainly what this site wanted. Hooray for the stupiding-down of our business. 7. I think I feel for Tom Benson in his family feud. I know enough about it to know he’s more in the right than his extended family is. 8. I think I still can’t believe the NFL accepted $723,734 from the Defense Department to honor military service members at league games and other league-sponsored functions. It’s the classic case of the greed personified that drives some league decisions, and the kind of decision that should force people at the highest business levels of the league to ask: Why on earth would we even consider taking money from the military to monetize patriotism in our stadiums? The only good thing—and I can’t praise the league for it, because it’s highly unlikely the league would have chosen to give the money back without being outed—is the NFL is giving the money back. 9. I think this will show my age. But no matter how quiet the Giants are about what Janoris Jenkins said to Paul Schwartz of the New York Post last week, about having five children with four women, none of whom is his wife, they cannot be happy with it. Said Jenkins: “When they were going with me, they understand, ‘OK, he’s a football player. He’s gonna have multiple women.’ That just comes with dating a football player.” So, monogamy is either highly unusual or just wrong for a football player? The establishment Giants owners, the Maras and Tisches, have to be gagging at the thought that for their football-playing employees, it’s expected that traditional families are passe. a. What a storyteller Morley Safer was, and how honest he was about how he felt uncomfortable doing TV, and how much he’ll be missed. e. Story of the Week: This, from David Martin of CBS News, about an Army captain and a Vietnamese citizen, with a fateful meeting after 41 years. g. I’d love to see major-league baseball teams in Havana and San Juan. h. Congrats, Joe Girardi, on managing your 1,500th major-league game Saturday. That’s a heck of an accomplishment, managing that many, particularly so many in New York. I think he’s a really good manager, a calming influence in a place than often tilts toward mayhem. i. RIP Alan Young, who died Friday in California at 96. Remember Mr. Ed? If you’re a person of less than a certain age, you probably do not. But Mr. Ed was a sandy-colored Palomino, and he talked. Alan Young was his owner, Wilbur Post, and he was the only person who could either hear Mr. Ed or speak to Mr. Ed, and they had a lovely, friendly relationship. This was one great TV show. Mr. Ed did a lot of fun things in it. He played for the Dodgers at Dodger Stadium. Clint Eastwood guested. Mae West guested. Sandy Koufax guested. I miss that darn horse, and Wilbur too. The show lasted five years in the sixties. l. Not much of an NBA guy, as you all know. But has any team ever been set up for a draft the way the Celtics are? They pick 3, 16, 23, 31, 35, 45, 51, 58. There are 60 picks in the draft. m. Total picks: 60. Boston picks: 8. Knicks picks: 0.
o. Wins in 2015-16: Boston 48, New York 32.
p. Beernerdness: I am taking your suggestions for best beer can in America. 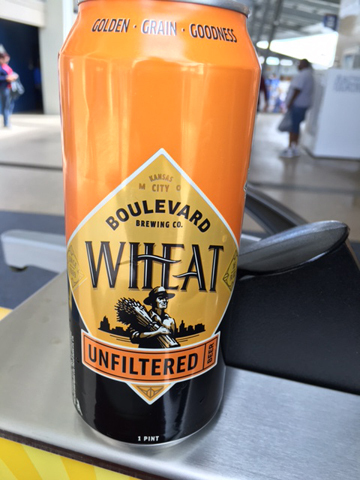 My first nomination: this one, from Boulevard Brewing in Kansas City—the Boulevard Wheat can. Thoughts? Send your nominations to me, and I’ll run them in a future column. q. You go, Exaggerator. With Rickey Henderson closing speed, Exaggerator won the Preakness and brought at least two Americans (watching in an apartment in Manhattan) to their feet. That was great. r. Really good story by Kevin Paul Dupont of the Boston Globe—and kudos to CSN New England’s Trenni Kusnierek for opening up—on the Boston TV sports anchor’s battle with depression. s. RIP, Kristin Wolford, the former sports editor of The Citizen in Auburn, N.Y. Gone far too soon, of colon cancer, at 35. She was the first female sports editor in the paper’s history, and a diligent and smart and dedicated one at that. t. Football Story of the Week: Davie Birkett of the Detroit Free Press with a tremendous piece on the attempted suicide of former Lions QB Erik Kramer, and how he has rebuilt his life since that fateful night. v. Jenny Vrentas, God bless her, will pinch-hit for me next Monday, as I take a week for some personal things. I am sure you will give her your undivided attention and absolute devotion—just as you always do with me. Have a great week.